Magnesium nitrate hexahydrate market in Asia-Pacific (APAC) is likely to witness a significant surge owing to robust adoption of magnesium nitrate hexahydrate as an efficacious oxidizing, dehydrating, and stabilizing agent in numerous industrial sectors. 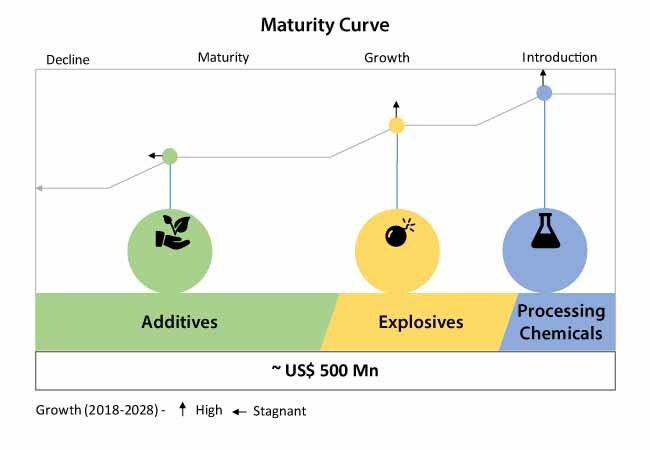 Steady growth in the petrochemical industry worldwide, particularly in emerging countries of Asia-Pacific excluding Japan (APEJ), such as China, will continue to fuel adoption of the magnesium nitrate hexahydrate in the coming years. According to a recent Fact.MR study, petrochemical industry will continue to witness a remarkable growth in Asia-Pacific (APAC), with its robust economic growth and domestic consumption, as economies in the region make a steady recovery. To mitigate an expanding energy security dilemma and capitalize on rising forecast demand, China’s government has pursued a policy of the petrochemical self-sufficiency. Today, China is the world’s largest chemicals producer and it is likely to stay so during the course of the forecast period. The demand from China’s chemical industry is likely to influence the overall demand in APAC – according to the report, APAC is expected to drive two-thirds of the magnesium nitrate hexahydrate market globally. Primary growth determinants for the magnesium nitrate hexahydrate market in APAC include effectiveness in fertilizer production, explosives and fireworks production, especially in the emerging countries of Asia Pacific region. According to the report, magnesium nitrate hexahydrate is widely used in combination with other magnesium salts, and it is formulated under strict supervision. The stringency in use of magnesium nitrate hexahydrate continue to be a short-term challenge for manufacturers, however, it is likely to have positive long-term impact, considering the growing focus on climate control. The competition in the APAC’s magnesium nitrate hexahydrate market is likely to intensify, on account of its widespread use in a range of industries. According to the report, market participants are focusing on consolidating their position through competitive pricing, supply-chain collaborations, and M&As. The study also offers forecast on the magnesium nitrate hexahydrate market at a global scale, and envisages the magnesium nitrate hexahydrate market to showcase a modest growth through 2028. The report states that effectiveness of magnesium nitrate hexahydrate in fertilizer production, particularly nitrogen fertilizers, has been expected to pose a proliferative impact on growth of the market. Additionally, the study projects the synthetic process used for manufacturing of magnesium nitrate hexahydrate to account for considerably larger market share than the nitromagnesite process. However, the nitromagnesite revenues are set to grow at a relatively higher rate through 2028. Increasing need for nitrogen fertilizers in tandem with the gradually growing agricultural sector will continue to fuel growth of the magnesium nitrate hexahydrate market. The Food and Agricultural Organization (FAO) states that ‘globally, the demand for nitrogen fertilizers has remained significant in recent years, with sales estimated to close in on 119,418,000 tons by the end of 2018.’ Given such healthy sales of nitrogen fertilizers, growth of the magnesium nitrate hexahydrate market will likely continue to surge in the future. Further, magnesium nitrate hexahydrate is a core source of nitrogen, and its steady adoption in the fertilizer industry will significantly impact growth of the magnesium nitrate hexahydrate.